Jayson Pearl has more than 25 years of franchising experience on his resume. For the past year he has led BrightStar Care as its chief brand officer. His role sees him leading cross-functional teams responsible for marketing, clinical operations, training, and national account management for more than 260 BrightStar Care locations in 38 states and Canada. Pearl has been with the BrightStar brand since 2009 when he became vice president of marketing and franchisee onboarding. He led the implementation of a system-wide rebranding effort, development of the BrightStart franchisee launch program, and the pilot program leading to Joint Commission Accreditation of all US BrightStar Care locations. He also served as senior vice president, brand development group before assuming his CBO role in 2012. He's familiar with franchise marketing and product development. He's had stints at San Jamar/Chef Revival and spent 15 years leading marketing and field operations for several large Burger King franchise groups and the regional pizza franchisor, Rocky Rococo Restaurants. As chief brand officer for BrightStar Care, I lead our corporate teams responsible for marketing, clinical operations, and national accounts. Formed as the Brand Development Group, we're accountable for driving the leading metrics that result in incremental sales and profits. Our mission is to both grow and protect the BrightStar brand. Creating a balance between investing to differentiate while ensuring franchisee buy-in and adoption of key initiatives. With a fast-growing brand in a rapidly changing industry, we are constantly calibrating our passion to lead, with the proper velocity of change for our owners. Listen to the voice of the families: We've been tracking our consumer experience of the seniors and children we service since 2007 through client surveys that measure satisfaction on attributes that drive our Net Promoter Score. Correlating certain attributes that create Promoters to revenue impact creates a feedback loop for prioritization of initiatives, new clinical programs and sharpening our marketing story. Listen to the voice of our franchisees: Great ideas and programs are only as great as their ability to be understood and easily executed with ROI achieved by our owners. We perform an independent franchisee survey every six months. Communication with our owners early and often on new programs and services is critical. Listen to the voice of our CEO and senior leadership team: Making sure that marketing initiatives and investments are aligned with our strategic plan and resources, while remaining agile to respond to new opportunities. We measure marketing results in three ways: performance metrics (including media direct response, lead generation, and conversion ratios, PR value with correlation of programs and campaigns to revenue increases), franchisee feedback loop (independent and internal surveys on the value our team and investments are driving for their businesses) and consumer sentiment (client and family feedback on our messaging, referral relationships, clinical expertise and service touches via surveys and social listening). Our internal team members act as both producer and leaders of the areas of advertising, social media, PR, creative production, local marketing toolkits, and service innovation. Their most important role is helping feed our high-performance culture with deep knowledge and accountability of their areas while being of service to our franchisees. They're also accountable to judge what can be done most efficiently with their own efforts vs. sourcing work and additional expertise with our marketing vendor partners. Consumers today have so many resources to learn about a brand before they click or call. In a business of serving seniors, children, and families at their time of need, the promises we make in our marketing have to reflect the truth of our service experience. Connecting to the emotional benefits sought by consumers helps us sharpen both our brand messaging and operational execution. Entrepreneurs looking to BrightStar as a business opportunity are expecting the same level of truth and transparency that our families desire when looking for quality home care. In working with our Franchise Development Team, we provide great information for independent review but also have a thorough process delivered by our franchise development team to provide candidates with the knowledge to ensure this business is right for them while we assess that the candidate is the right fit for us. We rely on industry and competitive benchmarks, franchisee testimonials, and publishing our performance data all to show the value of our franchise offering. We have one of the most comprehensive FDD financial performance representations (Item 19) in the industry. Prospective franchisees want to know that they're getting a strong ROI from joining an established brand and contributing to a General Marketing Fund. We show them how we help them build their business by delivering a combination of the local marketing toolkits, national advertising investments, and a growing online footprint. Technology is having an impact in two key ways. Certainly social technology is allowing us to have conversations with our clients, their families, and the nurses and caregivers looking for a career with our franchisees in new and exciting ways. Also, at BrightStar, the core technology that powers our franchisees' business is a proprietary platform that allows us to capture the data that matters to our business - everything from clinical outcomes to demographics to referral source and marketing performance. One of the most exciting ways we're using cloud technology is through an online platform we developed for family caregivers called CareTogether. It's a free, private, secure online toolkit that gives consumers tools for asking for and coordinating family and community support for their loved one. We give them scheduling, journaling, photos, communication, and condition-specific education materials. Families don't need to be a BrightStar client, but if they are, the CareTogether system connects with our business system to provide a consolidated calendar for the family. We provide a wide variety of opportunities for our franchisees and their management teams to learn and share with the corporate team - and each other. We host two annual conferences (one for owners, one for their managers), quarterly Town Hall calls, bi-annual regional summits, monthly Best Practice calls, weekly e-newsletters, and more. The most important thing we do with all of this is capture the tools, updates, and learning and post them on our Intranet so they become part of training and ongoing resources for our system. We provide a high level of transparency for our franchisees of our marketing efforts and investments through our Marketing Committee made up of seven owners reporting into our 12-member Franchise Advisory Council. We publish an annual report of the owner ROI from the General Marketing Fund to our franchisees that includes the expenses and balance sheet summary. I believe that marketing work is group work. Our brand-building initiatives and projects have to be informed by financial, technology, operational, and regulatory considerations. It starts with creating a Project Charter that articulates the expected financial impact for our franchisees, the roadmap to make it happen and - most importantly - the measures of success to ensure accountability to our internal partners and franchisees. We create online work spaces for collaboration and documentation on our internal Intranet that allows us to manage access to resources between internal teams and franchisees involved in our Task Force initiatives. We begin the budget process for our General Marketing Fund as part of our annual strategic plan, calibrated against our 3- and 5-year goals for the brand. We are consistently looking at the most efficient use of dollars vs. results. For example, balancing the deep knowledge and high service of our internal marketing team but pivoting to outside agencies when scale, external insight, or unique resources warrant. Last year, I developed a tool to provide visibility to the rest of our senior team on the key metrics that these investments are driving. Our Brand Development Dashboard is a way to look at impact and trends vs. our goals. We review spending vs. budget on a monthly basis and link expenses to performance. Absolutely. We expect our vendor partners to be as passionate about building the BrightStar brand - and our franchisees' businesses - as we are. We set high expectations for the investments they make in their own organizations to serve our growing number of franchisees and national footprint. We count on them to provide us with industry and competitive insight to make sure that we're consistently benchmarking our success and costs. In turn, we provide our approved vendor partners access to our franchisees to drive their opportunity via participation in our weekly newsletters, conference roundtables and sponsorships, and strategic planning sessions with senior leadership. The most profound change I've seen in the past 10 years is the brand message being delivered by consumers along with marketers. If customers are writing reviews about your brand that are in conflict with your marketing claims, there's a problem. 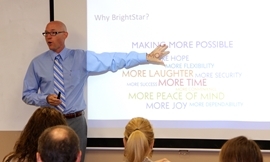 For BrightStar, we see this as an opportunity to understand and engage with our clients, families, referral sources, and nurses and caregivers about what is most highly valued in our type of service. Then we're empowered to help the promoters for our brand, well, promote - and make improvements via marketing, training, or operations to any concerns that we hear from brand detractors. As marketers, our ability to monitor and engage in customer conversations about our brands is a tremendous opportunity. The franchise concepts that are able to create a community of brand evangelists among their corporate team, franchisees, referral network, and front-line employees will win. At BrightStar, we're truly blessed with the active involvement of our co-founder and CEO, Shelly Sun. Shelly involves our senior team, corporate staff, and franchise community in the development of our strategic plan based on the vision she and JD had when they started BrightStar 10 years ago - and how that informs our 5-Year Vision and 3-year strategic plan. Our marketing plan is informed by the 3 year targets and is built on the initiatives that are consistent with Shelly's vision for the market share, service offering, and brand portfolio for BrightStar over the next 5-10 years. Our sophistication for creating and sharing this plan within our system has become much sharper over the 4 years since I joined this amazing brand. In many ways, we're making strides in communication flow that one wouldn't expect from a system that's grown 3 times in size since 2009. Higher involvement with our franchisees at the front end of key projects, greater shared business intelligence data, and increased field experience from key personnel are just some of the ways we're making better decisions as a brand and providing toolkits and marketing to our franchisees that drive results.